Which pretty much sums up all BBC coverage on climate change! The Looby Lou who filmed himself for the video comes from Prince Edward Island. His only complaint about the effect of climate change on the island is that “hurricanes are getting stronger”. 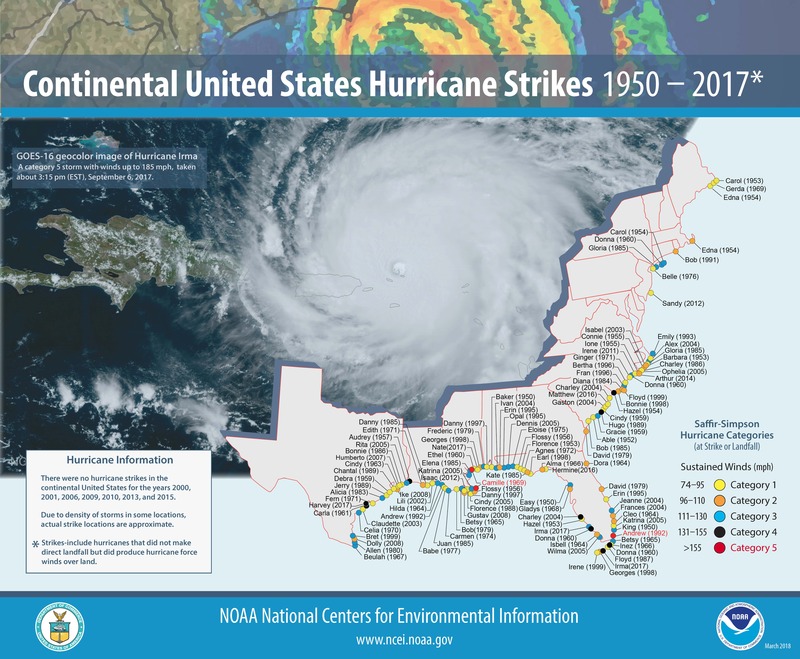 Interestingly, NOAA have a map of all hurricane strikes on the US, which shows that there have been no strikes at all north of Rhode Island since 1969. They don’t extend the list to Canada, but it is strong evidence that global warming has not pushed hurricanes further north, or for that matter made them stronger in New England. Notably, there have only been two major hurricanes that have made landfall north of N Carolina – Carol and Donna in 1954 and 1960 respectively. Perhaps Ofcom needs to get involved. One assumes BBC’s Charter extends to their ‘News’ website. If they call it news it should not include comment. Please, will anyone tell me why you all insist on paying for these r’soles?? Canada’s media is no better. The CBC is non-stop indoctrination and bias. The effects are obvious. The question today on Canada’s “The Weather Network” was what is the most common gas in the atmosphere? One in five (20%) chose CO2. Only 34% chose Nitrogen. About 3500 responses. Talk about dumbing down society. I do a similar survey of college freshmen, “name the three principal gases in the earth’s atmosphere,” and, “what is the gas that causes 80% of the greenhouse effect?” Only one in a hundred come close. This after 12 years of indoctrination. . . er, I mean, education. I meant to add that it’s too bad Jason McGregor’s parents weren’t as enlightened about social justice, white supremacy, climate change, and overall moral superiority as he obviously is. It is an example of the “availability heuristic.” The answers arise from the relative number of times the interviewees have heard the names of the gases, spoken by authority figures. I am, of course, a climate change sceptic. At least regarding carbon emission as the primary driver. I remain a dedicated Malthusian as I have been for fifty years. World population has tripled in my lifetime and is not significantly slowing. All wild large animals will have gone in fifty years as we gobble up their living space. person would have more anyway?) then the biosphere might stand a chance. So, good for him, I am grateful. Forget carbon, and methane and reducing eating animals and all that stuff. Find every ethical method possible to reduce the population, the faster the better. That is totally and completely the only problem we have. Period. Malcolm, the ‘ethical’ method for reducing population is to offer third-world populations cheap, reliable, available electrical energy. Then they no longer have need of large families to sustain their mediaeval life-styles. Anything else is immoral – and very Greenpeace. Like many people I have researched my ancestors. Coming from the Western Isles, Argyllshire, Lincolnshire and various xiversd parts of the HK. What stands lut is that in the 17th and 18th century 2 or 3 children make it to adulthood and marriage. Tben in the 19th century double figures of children be oming adults is the norm. With these large families many emigrated sometimes the wbole family of a dozen or more. Within a generation or two family size was back down to 3 or 4 surviving to adults. So it seems to me that large families go hand in hand with high mortality and low or subsistence incomes. Once more children survive the struggle to survive becomes more difficult leading to economic migration. In areas without industry small families and continued economic migration lead to depopulation. If limiting population growth and economic migration is the objective then creating wealth and industry in developing nations is the way to go. The key there is cheap plentiful energy. The almost perfect correlation between the sum total of human activities and atmospheric CO2 has been known (and consistent) for over 30 years. Read the small paper by Newell & Marcus: “Carbon Dioxide and People”. They discuss it realistically as the dilemma it is. Our current problem is not CO2 and population, it is the absurd idea that humans can affect the Earth’s climate by manipulating and mitigating this trace gas with geoengineering and a technological “control knob”. I agree, ultimately Malthus was correct. But the main threat from excessive human population on wildlife is not though “climate change” but the elimination of natural habitat, which has been reduced to the extent that there is no longer room on the planet for humans and natural populations of many species. Have you ever looked at how much of the world is actually natural habitat compared to how much is covered by Human habitation? Stupid Green “initiatives” are the biggest threat to nature and habitat and not the population. Elephants, Rhinos & Whales are not killed by “encroachment” they are hunted to extinction for tusks, horns & god only knows what for in the case of Whales. There is absolutely nothing stopping Humans and fauna living side by side. Whenever necessary I will continue to state the obvious: it is possible (in theory) to give every human being on the planet two acres of habitable land and by most calculations one-half acre of arable land. Sudan has the potential to feed the whole of Africa given some simple engineering and the political will. Malthus was wrong then as his disciples continue to be wrong today — as Ehrlich proves every time he opens his mouth. Harry Passfield simply quotes established evidence — alleviate poverty and population growth slows rapidly and dramatically. As usual, the eco-fascists are trying to put out a fire by pouring paraffin on it. We have encroached into the territories of species all over the world and it doesn’t help African Lions that there is some space somewhere else. Wild animals need a minimum space to survive and we have taken almost all of it. I am afraid that humans and animals cannot live side by side, except when all of the animals are in zoos. Well Malcolm we can start by stopping attempts to eradicate malaria, cholera, ebola etc. Then, without our man-made population changing, nature can use its toolkit of diseases to weed out humanity. Our generation can take credit for putting evolution into reverse, by increasing the quantity and decreasing the quality of humanity! I salute you, Malcolm, for not contributing to the future Human gene pool. Malcolm. It’s been a while since you checked population growth figures I take it. Growth is rapidly slowing down. You should read about what Mother Nature has done. 99% of all species that have ever lived have gone extinct. Numerous catastrophes. If Mother Nature was a real person she would have to stand trial for crimes against life. Why is it that humans have this obsession of keeping every single species alive? Maintaining status quo at all costs, even when it means hurting our own species. There are even species we can’t seem to eradicate even when we actively try. It’s funny how nature doesn’t work that way. In nature the strongest, the most adaptable wins. There are no charities taking care of the poor and the sick. If you can’t feed yourself or your kids, you die. If you can’t adapt to changing environment, you die. There is no benevolent government giving you a helping hand. I feel sorry for him. In 30 years time all his friends will be cooing over videos of their grandchildren and he and his partner will have – nothing. Never to hold a young baby just passing into a milk coma and say : is he /she smiling at me, or is it wind? One day it isn’t wind. Ever since that BBC memo in September (link below) they have happily shifted into full propaganda mode, the politburo probably threw a party when that happened, no further obligation to report on enemy number 1 of environmental activism … doubt. Whoever does the BBC news staff’s climate lobotomies has got a job for life. Him not having children is probably a good idea for the human race. Yup. All “climate loons” should be encouraged not to have children and remove their genes from the common pool. Do you know what “category” they are at landfall and are they increasing? If neither the Beeb nor GPeas have reported increases, then it’s a given that they aren’t. The nillist, anti-human philosophy: what a sad commentary on current, western civilization!! The BBC doesn”t challenge it and, by not challenging it, endorses it. Who thinks the rest of the planet agrees? And …. how many zero-kids people are actually self-involved, narcissists using virtue-signalling as a cover for not becoming useful members of the adult world? The media like to act like appearances equal reality. Those who have matured know this is rarely the case. Skepticism isn’t being mean, it’s being reasonably aware. Paul, have you watched the BBC News “Weather Programme”? It is out and out CAGW propaganda, in many cases self contradictory. With classics like Coldest ever March, Snow 2 months earlier than normal, the hottest for decades, never before seen in our lifetime, the worst for 100 years etc. It is always half the story, never the actual facts. And pushing Wind Power like mad with a wind Farm that “can” supply power for 400,000 homes, but never mention what it supplies when the wind is not blowing. 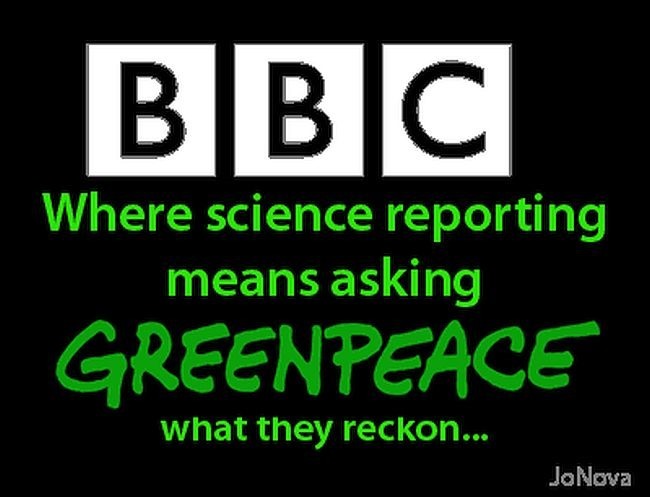 You will fail if you think you can fight BBC/Greenpeace with facts. They aren’t interested. Sorry I have run out of polite comment on the BBC coverage of climate matters. The worst offenders seem to be those media who are paid directly by the public. The self-serving abuse will end only when the public cuts off the valve. Maybe EU state aid rules could be used against the BBC, and a good case could be made that the license fee money should be distributed fairly among ALL broadcasters. After March that question becomes academic. This person is not alone. Thousands of couples are making that decision. It won’t end well when in their old age they realise they have no children to look after them or grandchildren to spoil because they listened to some idiots years ago, who have since been proven to have got it wrong. \\ The centuries-old tradition of husky racing is alive and well in the US state of Alaska. Is this why they are recruiting Angelina Jolie to front an education series? Hmm, and she is thinking of entering US politics (no prizes for guessing on which side), i.e. the new Michelle Obama, no wonder the BBC WS is providing free publicity and financial support. Any html coders out there ? How many times on the normal webpage do you see the word Climate ? 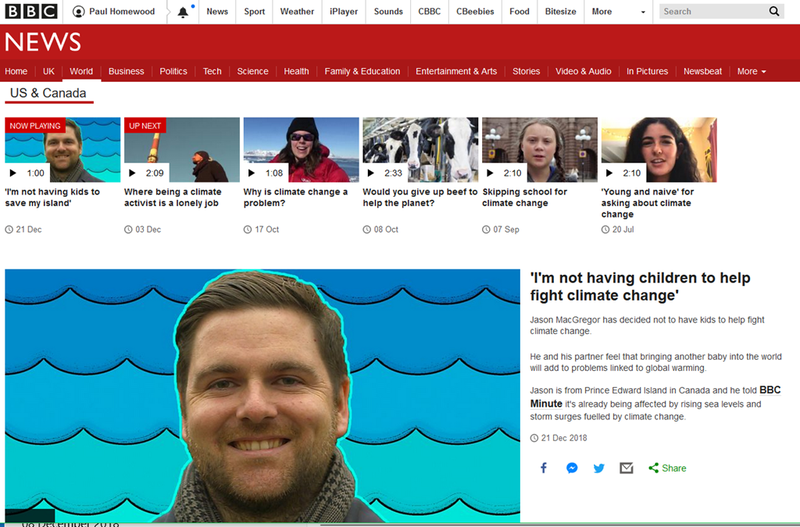 This page top right is marked NEWS, it should say "Climate Activist adverts"
If the government funded BBC is serious about supporting this propaganda theme presumably they will be pulling their annual “Save the Children” appeal. Scary times! How arrogant you have to be to believe that you not having kids will have any effect. Everyone else obviously don’t give a crap. Fine example of empty virtue signaling and attention grabbing.